Today’s review is all about the ongoing battle of the AKRacing ProX vs. the infamous King Series of DXRacer. Two hot-blooded competitors that haven been splitting customers into two factions ever since the premium segment was introduced to the gaming chair market. Both seats were serving their brands as flagships for quite some time, still rendering them grail-chairs for many gamers who enjoy more breathing room today. I will not only review the ProX Series in every detail – quality, adjustability, ergonomics and comfort – but also give you an in-depth comparison with the K-Series. Lastly, do not miss the critical Size Guide as well as the obligatory Buying Guide – the latter might save you some serious money. Alright, let us cut the banter and get right into today’s review! I bought my ProX a few months after reviewing the King, which had been my chair of choice since that day. As the Prox Series began acquiring more and more fans, the community almost demanded a review of this seat – and I have got to say: the raw data left me pretty interested as well. Although there are some pretty neat designs available I went for the sophisticated black/grey/white model – which honestly is kind of colourful by my standards. Just now amazon has a very attractive offer for the ProX – make sure to check it out! From its massive body over the 3-color style all the way to the ProX’s uniquely shaped side boulders – AKRacing not only added a new top tier in matters of sturdiness to their repertoire but created a chair that stands out compared to the usual mishmash. You will find the brand’s logo on the pillows as well as on the front and back of the headrest. The lettering “ProX Series” resides on the face of the seating surface. Sadly what also stroke my eye was that little wrinkle on the backrest’s left “wing” one can identify in the above image – certainly, something quality control should have stumbled upon before sending it out to a customer. The ProX Series was released as the PC chair of choice for gamers that enjoy or require roomier measurements. Therefore, the backrest is higher and the seat wider than usual while the metal frame has been reinforced to offer appropriate stability for up to 150 kilos. 55 kg per m³ is the density of the cold foam batting which is considered very robust longevity-wise. Sitting on it feels rather soft though and you sink in relatively deep compared to others chairs with an equal density level. Since most customers enjoy that kind of seating sensation, you will probably like it as well. For my own part, this leaves me questioning the seat’s durability – find out how this turned out after 1.5 years of testing later during this review. As it is the case for almost all modern gaming chairs the ProX Series is PU-leather only – fabric lovers loose out again, but since PU is the established standard one has to cope with it. Quality-wise the covering is on par with the industry’s standards regarding thickness, feel and optics at the time of this review only superseded by noblechairs. The last-named brand also does a better job at aligning the covering but the manufacturing precision of the ProX is still good and within expectations. Other than that, it is out of the question that ProX owners will like the posh looking, easy-to-clean PU-leather at first glance. Base & casters – shiny and solid? In contrast to black dominating as the common colour of choice, AKRacing decided to hook up the base of my ProX with a stainless steel optic. The other available, more colourful designs – blue, red, white – have their bases painted in a respectively suitable colour. Since the manufacturer uses equally sized castors on every product the ProX does not stand out – however, they are pretty though and operate smoothly. What attracted my attention when I first grabbed the base assembling the chair is that it is more or less hollow. Even though this is by no means a serious issue, I would prefer some strutting for additional support. It is still heavy and feels sturdy, so I leave my concerns out there for gamers maxing out on the ProX’s weight limit – for everyone else: Do not worry about that. Is the missing fourth direction (in and out adjustability) something I need in practice or just a nice-to-have? Surprisingly the limited adjustability leads to more stability – to be precise: There is less wiggling around. Furthermore, in the rare case that you are reliant on a few centimetres more or less width between the armrests you can still adjust them using the screws at the bottom of the seating surface. In the picture above you can see the two levers that operate the tilt and rocking function as well as the height of the seating surface of the ProX (42-50cm). The setting dial at the bottom of the seat lets you adjust the drag of the rocking function to coordinate it with your bodyweight. One can lock the seat at almost any position within in the 12° rocking radius while the backrest allows for an incredible 180° maximum recline – which is way above-average and a feature of all AKRacing chairs yet released. Is it a decisive factor to be able to get into an 180-degree recline position in practice? Most likely not. But is it nice to have? Definitely. For a quality PC chair, it is a must-have feature to offer proper neck and lumbar support allowing the user to adopt an ergonomic posture. Gaming chairs usually accomplish this by mounting two height-adjustable pillows within the neck and lumbar area – so does the Prox Series. 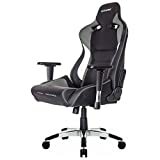 Both cushions wrap themselves in PU-leather which is the industry’s standard although personally, I prefer the velvet fabric material noblechairs introduced. Optically they suit the ProX perfectly – check out the lumbar pillow in the picture above – and they certainly do their job. After about 1.5 years of test-sitting the ProX it still occupies a fixed place in our little office which in itself speaks for the quality of the chair. This part of my ProX review covers the long-term seating sensation as well as the state of the seat’s condition after being used extensively within a meaningful timescale. The ProX Series is more spacious and massive than all the previously released AKRacing chairs. A wider seat and a higher backrest accommodate averagely sized gamers as well as athletic or heavier, taller users. The added space prevents feeling wedged into the seat after many hours of sitting. If you are relatively petite and favour the feeling of getting hugged by your chair you should consider buying a more filigree model. For everybody else, the ProX is a viable option! I prefer the roomier type of chair a ProX embodies since it offers more comfort for gamers like me who spend 8 hours plus a day in front of their PCs. I also like the softer batting, and I can not say that it is any less comfortable than harder alternatives but all in all, considering ergonomic qualities, I lean more towards to the latter. The seat’s padding might be the parting of the ways – why? Because on the one hand it is remarkably soft which a lot of you guys prefer comfort-wise but on the contrary, this very same fact might affect its durability negatively. Durability – Hardboiled Or Flappy? Most of the ProX’s components have endured the last 15 months remarkably well. No obvious signs of wear and tear anywhere besides for a few little scratches here and there. It is out of the question that in comparison to cheaper chairs the ProX Series is superior in matters of durability. But – yeah, there is a small “but” – if you compare it to the EPIC Series of noblechairs or even to its nemesis the King Series, I have to say that the PU covering has suffered a tiny bit more. Do not get me wrong, this is criticism on a high level, but I have got to mention that one can surmise a few wrinkles forming here and there on the seating surface. Although this is entirely normal after 1.5 years of usage, the competitors mentioned above just performed slightly better in my reviews. Since what I just described is so minimal it could likely be an individual case. I would advise you only to take this into consideration if you are out of arguments and just can not decide between the ProX and another chair. I hope you do not blame me because I again picked a non-colourful chair for my ProX review – that is just how I roll. However, AK put a version for almost everybody’s taste into the mix. From an innocent white to a fiery red – it is all there. As far as I remember AKRacing was the first brand to introduce ball-bearing rollerblade casters to the gaming chair market. The good thing is that these extra silent, floor-friendly wheels are based on a standardised plug-in system which makes them a viable option even for foreign brands like Vertagear or GT Omega. User’s Size Both chairs are qualified for accommodating gamers with a bodyweight or stature above average. Where the King offers more leeway width-wise – +4cm between the seat’s side boulders – the ProX is more friendly towards taller guys due to the shape of its backrest. Upholstery I consider the King’s hardness grade as normal whereas the ProX is noticeably softer. I leave it up to you to decide which variant gets the vote. Adjustability While the ProX trumps with its 180-degree recline position the King shines with one adjustable direction added to its armrests – at the cost however of rendering it less firm. Overall Quality Honestly, in my opinion, this is a tie. True, my ProX had this wrinkle in the backrest from the start, a less solid base and insignificantly more wear on the seats covering. But I have to underline that all of this is either very minimal or maybe just bad luck. And the winner is … no clue – have you made your descision yet? Because I have to say that it is on you to balance the pros and cons in this ProX vs. King Series matchup. As far as my honest option goes these are two great chairs going head to head in my reviews! While a 2-meter guy might get away with 120kg of body weight, a gamer at the same weight but not taller than 1,75m is not going to have fun sitting in this chair. The shaping of the headrest area allows you to drag the neck pillow a little higher which in turn levels up the maximum user’s height to about 2 meters. Optics: The term “Gaming Throne” as the ProX is often referred to is a perfect fit. It just looks like a throne with its massive appearance, generous dimensions and uniquely shaped side boulders. Functionality: The Prox Series has everything important onboard like adjustable pillows as well as armrests, tilting and rocking. The fact that the ProX’s armrests are firmer than the usual 4D-version, in my opinion, makes up for the loss of one direction – furthermore, you can still adjust the width via screws. Quality: The materials used – steel, aluminium, synthetic leather, PU – are as expected quality-wise and the manufacturing also complies with the industry’s standard. The ProX I reviewed had minor flaws regarding quality control, but as far as my experience and community feedback goes, this is clearly an individual case. Comfort: For most customers, the extra-soft padding is a welcome token. Many of you strive for a couch-like feeling as the ultimate epiphany of comfort, and the ProX is the perfect answer to that. The spacious design is also an excellent premise for guaranteed comfort during extended sitting sessions. Throughout my review, the ProX turned out to be a versatile gaming chair trumping with its generous dimensions and unique design. Quality, durability as well as flexibility create a positive overall impression and for the premium chair the ProX embodies its cost-benefit ratio is very satisfying. For me, the title “Throne” is as well-deserved as the hereby awarded golden guturback.uk trophy! As far as buying the ProX goes Amazon is most likely the place to go. Even though you can not always count on the expertise there, the pricing is just unbeatable, and for inquiries, you can always contact the fabricator.